Bangkok's showcase new international airport is no stranger to controversy. Built between 2002 and 2006, under the governments of then-Prime Minister Thaksin Shinawatra, the opening date was repeatedly delayed. It has been dogged by allegations of corruption, as well as criticism of the design and poor quality of construction. Then, at the end of last year, the airport was shut down for a week after being occupied by anti-government protesters. Now new allegations have been made that a number of passengers are being detained every month in the duty free area on suspicion of shoplifting, and then held by the police until they pay large sums of money to buy their freedom. That is what happened to Stephen Ingram and Xi Lin, two IT experts from Cambridge, as they were about to board their flight to London on the night of 25 April this year. They had been browsing in the duty free shop at the airport, and were later approached by security guards, who twice asked to search their bags. They were told a wallet had gone missing, and that Ms Lin had been seen on a security camera taking it out of the shop. The company that owns the duty free shop, King Power, has since put the CCTV video on its website, which does appear to show her putting something in her bag. However the security guards found no wallet on either of them. Despite that, they were both taken from the departure gate, back through immigration, and held in an airport police office. That is when their ordeal started to become frightening. "We were questioned in separate rooms," Mr Ingram said. "We felt really intimidated. They went through our bags and demanded that we tell them where the wallet was." The two were then put in what Mr Ingram describes as a "hot, humid, smelly cell with graffiti and blood on the walls". Mr Ingram managed to phone a Foreign Office helpline he found in a travel guide, and was told someone in the Bangkok embassy would try to help them. The next morning the two were given an interpreter, a Sri Lankan national called Tony, who works part-time for the police. They were taken by Tony to meet the local police commander - but, says Mr Ingram, for three hours all they discussed was how much money they would have to pay to get out. They were told the charge was very serious. If they did not pay, they would be transferred to the infamous Bangkok Hilton prison, and would have to wait two months for their case to be processed. Mr Ingram says they wanted £8,000 ( about $13,000) - for that the police would try to get him back to the UK in time for his mother's funeral on 28 April. But he could not arrange to get that much money transferred in time. 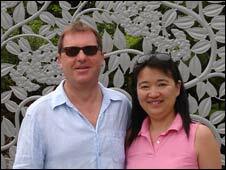 Tony then took Ms Lin to an ATM machine and told her to withdraw as much as she could from her own account - £600. He then withdrew the equivalent of £3,400 from his own account. According to Mr Ingram this was then handed over to the police, and they were both forced to sign a number of papers. Later they were allowed to move to a squalid hotel within the airport perimeter, but their passports were held and they were warned not to leave or try to contact a lawyer or their embassy. "I will be watching you," Tony told them, adding that they would have to stay there until the £8,000 was transferred into Tony's account. On the Monday they managed to sneak out and get a taxi to Bangkok, and met an official at the British Embassy. She gave the name of a Thai lawyer, and, says Mr Ingram, told them they were being subjected to a classic Thai scam called the "zig-zag". Their lawyer urged them to expose Tony - but also warned them that if they fought the case it could take months, and they risked a long prison sentence. After five days the money was transferred to Tony's account, and they were allowed to leave. Mr Ingram had missed his mother's funeral, but at least they were given a court document stating that there was insufficient evidence against them, and no charge. "It was a harrowing, stressful experience," he said. The couple say they now want to take legal action to recover their money. The BBC has spoken to Tony and the regional police commander, Colonel Teeradej Phanuphan. They both say Tony was merely helping the couple with translation, and raising bail to keep them out of prison. Tony says about half the £8,000 was for bail, while the rest were "fees" for the bail, for his work, and for a lawyer he says he consulted on their behalf. In theory, he says, they could try to get the bail portion refunded. Colonel Teeradej says he will investigate any possible irregularities in their treatment. But he said any arrangement between the couple and Tony was a private affair, which did not involve the police. Letters of complaint to the papers here in Thailand make it clear that passengers are regularly detained at the airport for alleged shoplifting, and then made to pay middlemen to win their freedom. The Danish Embassy says one of its nationals was recently subjected to a very similar scam, and earlier this month an Irish scientist managed to flee Thailand with her husband and one year-old son after being arrested at the airport and accused of stealing an eyeliner worth around £17. Tony told the BBC that so far this year he has "helped" about 150 foreigners in trouble with the police. He says sometimes he does it for no charge. The British Embassy has also warned passengers at Bangkok Airport to take care not to move items around in the duty free shopping area before paying for them, as this could result in arrest and imprisonment. 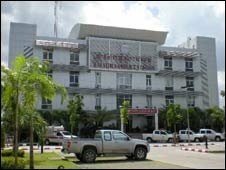 A similar system operates in Cambodia. Police arrest foreigners in the street and you are contacted by someone who claims to have influence with the police and judges and who asks for large sums for your immediate release, which doesn't happen. I was even told at my friend's trial that the police would provide witnesses of my friend's offence if more money was not immediately provided. Even though there was no evidence against him and he was acquitted, a large sum had to be paid to the prison authorities for his release. Two friends and I travelled to Bangkok 29 December 2008. We were really worried about the situation there, as the airport had just been closed for some time several weeks before. Aside being quite harassed by taxi drivers who wanted to take us to hotels they no doubt received commission from, the experience wasn't very trying at all. Another scam at Bangkok Airport is when the Thai customs meet passengers off airplanes from Dubai/Qatar where there is cheap duty free. The customs tell passengers to put duty free items inside their check-in luggage when they take it off the carousel - or they will be prosecuted for smuggling. They then tell people that it will be OK not to show or declare any duty free items. When the passengers reach the arrivals area, the customs pounce and you are arrested and taken to customs head office at BANG NA and told to pay four times the duty or go straight to jail. There is an ATM machine next door to the customs office. Your goods are kept by the officers and they then pocket the money you have paid them and you are free to go without any criminal record. Same happened to me in April this year. The police arrested me and charged me approx £400. There were 5 of us in our group, we purchased 1000 cigarettes at Heathrow, but on leaving the plane at Bangkok the police approached me and told me to keep them in one bag. I did as I was told, and that was the set up, so when I got through customs with the other four people they arrested me and would not accept what we told them. They took copies of my passport and made me sign at least six documents, all in Thai. They would not give me copies so at this moment I don't know what I signed. They escorted me to an ATM. I have been in touch with the British consulate who asked me if I want to make a complaint but I don't want to go to another country and find they have done something to my passport. I will never return to Thailand again, it was the scariest time of my life.